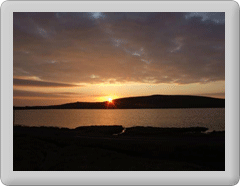 Fetlar has for long been an island renowned amongst ornithologists and naturalists the world over. Not only is it Britain’s premier site for the beautiful red-necked phalarope - boasting over half of the country’s breeding population - the island is also famed for hosting the UK's first and only breeding pair of snowy owls which bred successfully between the late sixties to the mid seventies. Prior to the nesting discovery of this majestic Arctic breeder, Snowy Owls had been around on the isle for many decades. Sadly, by the mid-nineties the aging descendants from this pair had all died out. 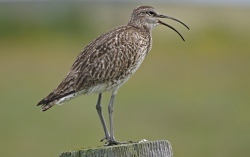 Zoom imageWhimbrel. Through out the summer months the moorland, hills and fertile soils of Fetlar are brought to life with the beautiful sights and sounds of the highest densities of breeding wading birds in Shetland. Good numbers of golden plover, dunlin, redshank, lapwing, curlew, snipe, oystercatcher, ringed plover and more notably whimbrel, can be seen. 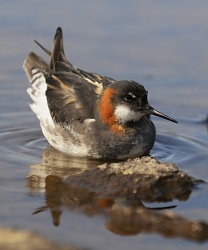 Zoom imageRed-necked Phalarope. 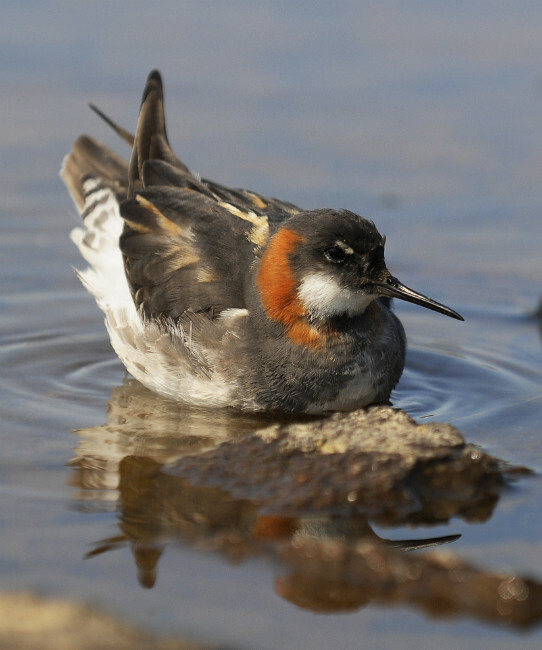 The bird most visitors want to see is the dainty red-necked phalarope, which is famed not only for its stunning plumage but its unusual sexual role reversal. The smaller, duller males perform the incubating and chick-rearing duties, while the brightly coloured females are left free to try to find a second mate! At the RSPB hide at the Mires of Funzie, phalaropes can be seen in their nesting habitat. Closer views are, however, more likely along the roadside shore of the Loch of Funzie where the birds come to feed and bathe. At this same site, you may well be rewarded with privileged views of the handsome red-throated diver. The haunting calls of these stunning divers can be heard echoing from many of the bays and moorland lochs. Visitors are reminded that it is an offence to disturb divers, phalaropes or whimbrel at their breeding sites. The hills and heath hold large populations of great and Arctic skuas, although the latter is much less numerous. Around the coast and cliffs of the island good numbers of breeding seabirds can be found, especially along the higher north, east and west cliffs where all common breeding seabirds can be found with relative ease. Gannets however, although they will be seen coasting by or feeding off the shore, do not breed on the isle. For the keener and more adventurous ornithologist, storm petrels and Manx shearwaters may be seen or heard as they return to their nesting burrows during the small hours of the night. The scree cliffs of Grunni Geo along the west of Lambhoga are the best bet for the petrels which nest amongst cracks in the rocks and amongst boulders. Manx shearwaters are however now a very scarce breeder, mainly along some of the greener sheltered cliffs of Lambhoga. Now reduced to a handful of breeding pairs, one or two can occasionally be seen in late evening in the Wick of Tresta. Common songbirds include skylarks, meadow pipits, wheatears and Shetland subspecies of wren and starling. Breeding birds are by no means the only claim to fame for Fetlar. The island is well known by keen birders for its ability to attract off-course migrating birds, due to its geographical location. It is Shetland’s second furthest east lying island so it is one of the first points of land fall for exhausted migrating birds in spring and autumn. Common, scarce and rare migrants are found in good numbers year after year. Headline rarities found on the island over the years have included Britain’s first ever record of chestnut-sided warbler, second ever common yellow throat, little swift, two red-flanked bluetails, Isabelline shrike, Swainsons and hermit thrush, lesser scaup, Pacific golden plover and white–throated sparrow to name but a few. Although often quiet, winter can produce some good quality birds; white-billed diver and king eider are recorded off the island almost annually. The island has also hosted several gyr falcons over the passed few years. More commonly, great-northern diver, purple sandpiper and long-tailed duck can easily be seen round the island. Zoom imageWildlife watching in Fetlar. 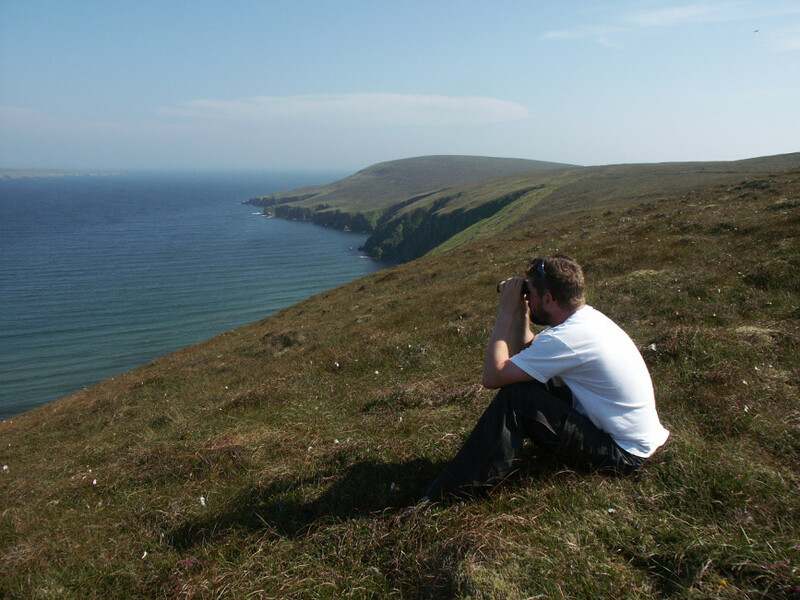 The waters around Fetlar are renowned fishing grounds and during the summer months, with a combination of luck, time, effort and more importantly calm seas, a few species of whale and dolphin are recorded annually, both from the shore and boats inshore. Apart from harbour porpoise (or ‘Neesik’), the Minke whale or ‘Herrin Hog’ is by far the most regularly recorded, especially from the east cliffs and in the wick of Aith/Houbie during mid to late summer as they feed on the returning herring and mackerel. In the same areas, white-beaked, white sided and Risso’s Dolphins are recorded in small numbers each summer. 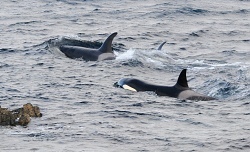 Zoom imageKiller Whales. 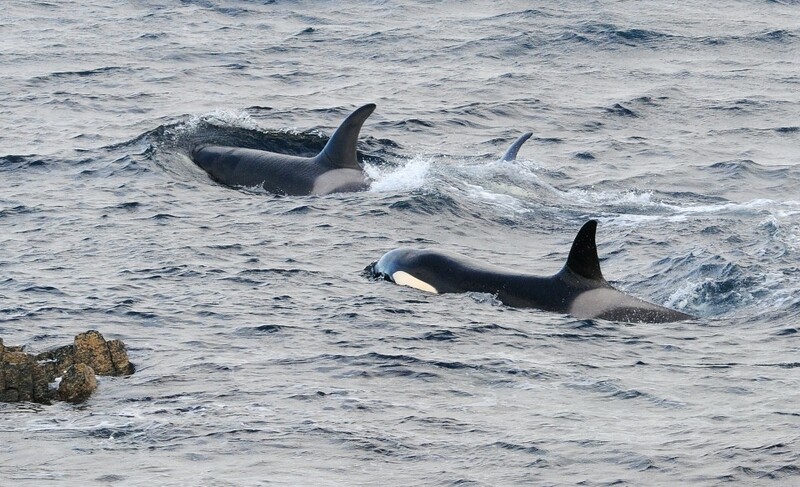 Killer whales usually put in at least a few random annual sightings round the isle but, as with the sightings round the rest of Shetland, this could be any where at any time. They are as likely to be seen on the ferry crossing from Yell or Unst, as they are from any headland or viewing point. Fetlar is also one of the better islands for otters and, although shy, they can be seen quite easily, fishing along the shallower lengths of coast. Common and grey seals can be seen all round the isle, although the latter tends to occupy the more remote shores of Lambhoga, the northern Blue banks and the eastern cliffs, where as the common seals are found hauled out along the coasts of Urie and small off-shore Skerries. In 2017 and again in 2018 Humpback whales were seen near the island.